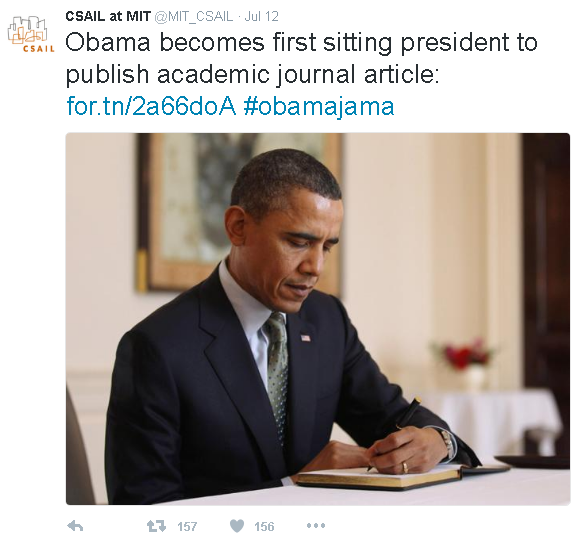 I have read a few sources claiming that Obama's JAMA paper published this month was the first academic journal article authored by a sitting president. Is that true? It's hard to prove a first, because you have to prove that it has never happened before. However the preponderance of evidence seems to be in favour of it. The evidence comes in two kinds. The almost complete absence of right wing media pointing out that this is not true. You know if there was a way to be attacking the President on this they would be doing it. Not the answer you're looking for? Browse other questions tagged united-states history barack-obama research . Is Obama the first U.S. president to “bow to a Muslim King”? Was Christian Europe the first place to abolish slavery? Is Obama the first President of the US to write a computer program? Is Obama the first U.S. President to skip the funeral of a sitting Justice? Did Obama remove a Winston Churchill bust from the oval office? Does Trump spend $10m/month travelling compared to Obama's $1m/month?